Nooing [kuh-noo-ing] verb, a form of amphibious travel around lakes and forests wearing a canoe on your head. See also knackered. Having survived the American experience driving across the south of the Great Lakes, it wasn’t long before the intrepid explorers developed itchy feet in the sweltering Montreal metropolis. The vast majority of the Great Lakes, we discovered, were great in terms of scale but otherwise quite disappointing – in particular the ability to swim without emerging glowing green and sprouting an extra set of ears. Our mission was incomplete, we had to venture further, this time to the north of Montreal. It is no coincidence that 90% of the population of Canada live with 100 miles of the US border for not only for climatic reasons (even Montrealers live in a cryogenic state for 6 months each year), but also practical – it’s only lakes, trees, ice (and a smattering of hardy indigenous Inuits). In short, it’s not particularly hospitable, unless you’re an insect but more about that later. If you’ve ever flown from the UK to American Pacific coast, then chances are you’ve flown over Canada and gazed out of the window for hours, marvelling at the relentlessly static scenery below: trees and lots and lots of lakes, in fact over 2 million of them. Occasionally you’ll see a road chiselled into the landscape in unwavering fashion for hundreds of miles, but they hardly constitute a comprehensive road system which leaves transportation restricted to seaplanes and boats. 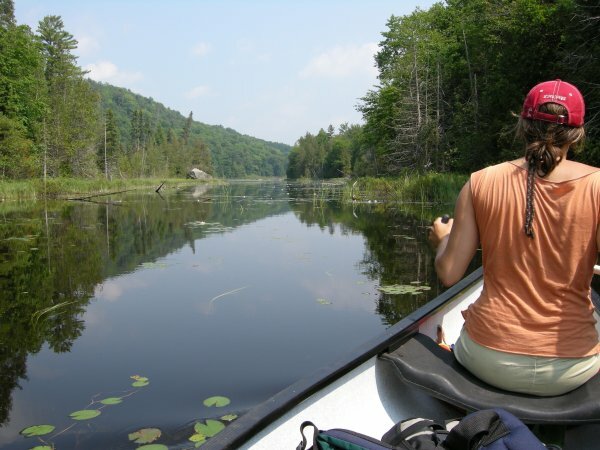 North American Indians have been navigating the lakes, streams and forests very effectively for thousands of years using a canoe (or “kenu”, which translates as dugout). However, as canoes are not particularly effective over land they are constructed such that they can easily be carried. For reasons devoid of sympathy with the human form, the preferred method is to stick the canoe on your head – or “portage”, from the French porter, to carry. The planning phase of our new trip involved consultancy with Benoit, a good friend of Alison. He’s the kind of guy to whom no mountain is too high, no ice too cold, no bear to tough, no paddling too arduous and no portage too long. Two options were presented: a long drive to La Verendrye, a series of large lakes with few portages, or a shorter drive to Papineau-Labelle with smaller lakes and longer portages. I still had a sore heel from my impromptu trip across hot coals a few weeks prior, but this was nothing compared to the back injury I received in a bizarre tennis incident. 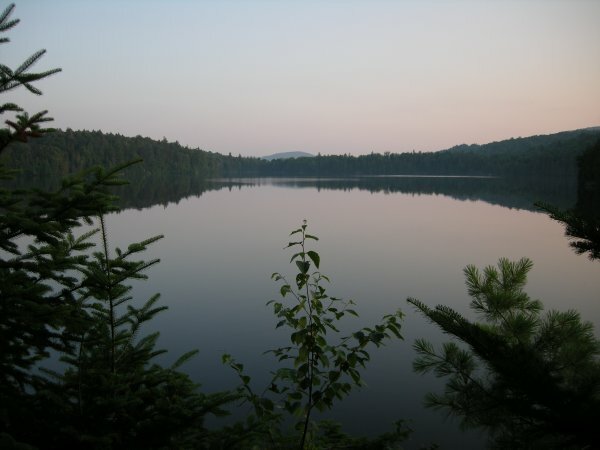 Benoit suggested a highly ambitious route encompassing each and every one of the lakes in the Papineau-Labelle area. The gauntlet clanked to the ground and the shorter drive won. No contest. Our intention was to drive out on the Thursday 26th July and back on the Saturday, so off to the car hire shop I went. I had pretty good car-karma last time and was confident of another budget car upgrade. Like last time they were out of crap cars, but unlike last time I was instead downgraded to a masquerading lawnmower. Bags packed, food stashed, lawnmower filled and northwards we headed. A few hours up the highway, a sharp turn left, continue for 40 mins down an ever narrowing road and to Nominingue – comprised of a couple of streets, hunting shops, some bars and plenty of tumble weed. Turn left, right, right again, left (these were Benoit’s directions) and down to end of the road – at least as far as the tarmac was concerned. We proceeded in our unsuitable car navigating the increasingly rocky “road” for another hour until we found the state park office. We registered or intentions and took more arbitrary directions that we followed for another 30 mins until we eventually found the canoe “put-in” site by the lake. It looked as though we were about to receive a stern safety lecture from the solitary guy tending the site, but not quite; he handled us a couple of paddles, waved in the general direction of the canoes and disappeared. Our luggage was one large rucksack each and a smaller one containing essential items, like camera, car keys and a map. We hauled them into the canoe and slid off into the lake estuary, quickly reacquainting ourselves with canoe protocols essential for forward propulsion. We were on Lac des Sept Frères, a 9km lake and the longest in the series which, according to the map, was home to 12 campsites. I should qualify the expression campsite: it is a small clearing in the forest, chosen for logistical and scenic qualities. It accommodates a bunch of rocks to house a fire and a designated toilet area – an inverted bucket with a hole. 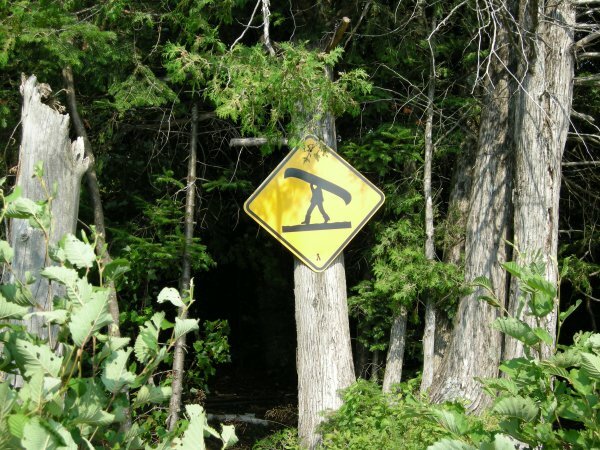 The only clue to the existence of the campsites and portage routes are small yellow signs stuck on trees. There is no booking system – if a campsite is occupied then onwards you go. The first few sites we passed were full and mild concern immediately stuck us. At the first vacant campsite we presumed the trend towards solitude would only increase. Our theory proved quite correct, so onwards we paddled, for an hour up to the end of the lake by which time it was 5pm and time to start thinking about making camp. 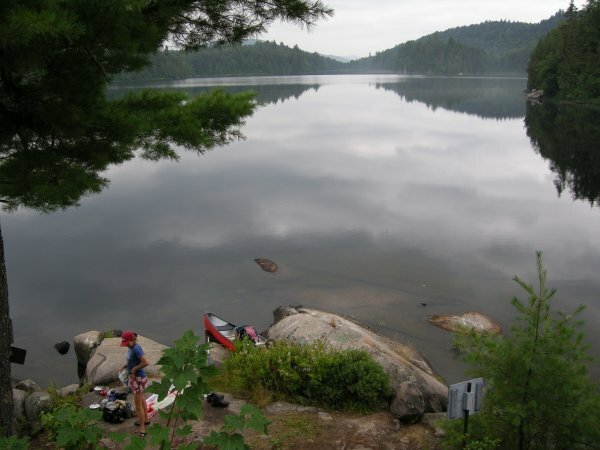 According to our map, there was one smaller lake beyond Lac des Sept Frères, home to a single site on its northern peninsula and connected via a 185 metre portage. Should this site be occupied we would have no choice but to turn back. Never a couple to shirk a challenge, we took the risk – we figured that portaging would be an anathema to most normal people, even relatively short ones like this. 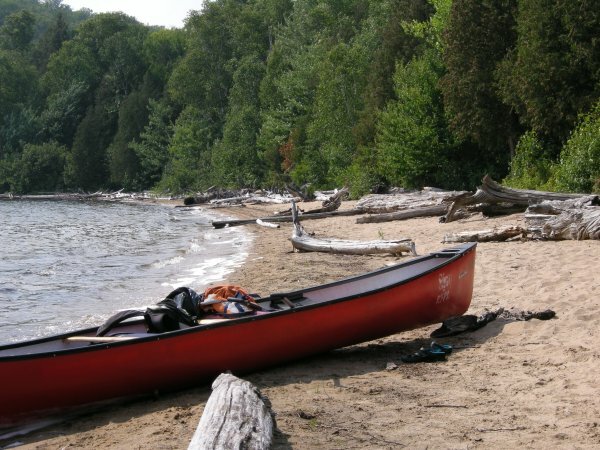 We landed on the beach at the northern shore of Lac des Sept Frères to a welcoming party of mosquitoes, deer flies and horse flies. I was lucky enough to encounter the last remaining seasonally confused blackfly of the year, a bug that maybe minuscule in size but is 98% teeth, 2% aggression and chomps away at your skin leaving a scene reminiscent of the Texas Chainsaw Massacre. The advise from Benoit had been clear: wear lots of clothes whilst portaging; with your arms occupied carrying the canoe, you are unable to prevent the gazillion bugs from feasting on your sweaty skin. To make matters, mosquitoes are actually attracted by carbon dioxide, which collects in abundance inside an upturned canoe as you huff and puff underneath. Naturally I nominated Alison for the first portage. It took us down a tiny track deep into the bug infested woods and emerged 10 minutes later at the foot of “Lovers Lake” (not, I believe, its official name), covered in sweat and insect bites. But it was well worth the effort as we were now standing by the most beautiful lake imaginable – and it seemed to be all ours. As we paddled towards the designated campsite, guided by a speck of yellow on the other side of the lake, it became apparent that our gamble had paid off – we were very much alone. Upon reaching the site, we unloaded the canoe and surveyed our territory with huge satisfaction and not insignificant awe. First task: swim. As modesty wasn’t exactly an issue here, we jettisoned stinky cloths and jumped straight in. Soap is a bad idea not only for ecological reasons, but also because bugs love the perfume, and we weren’t a fan of bugs. Now, you may think it sounds nice to swim naked in a huge fresh water lake, golden sunshine beating down, completely alone – but you’d be mistaken. It is one of the most privileged experiences I have ever had, and renders all superlatives meaningless. You can feel every cell in your body realign themselves to form one huge continuous grin. All the cats in Cheshire would be humbled. I think you get the idea. After the swim, the soap-dodgers attended to more mundane matters, like water, food and shelter. For the former, we had bought a small water purifier that resembled a deflated octopus. My task was to erect the hammock, and Alison’s to get some water. After 30 minutes of trying to remember the bowline knot, I gave up and deployed industrial grade granny knots to attach the hammock between a couple of trees – but no sign of Alison. I went over to see how she was getting on and was greeted to quite a sight: balancing precariously on a large rock over the lake, she had one tube wedged between her toes holding the spout as deep into the water as she could manage, the purifier cylinder clenched between her knees, one hand holding another tube aiming purified water into a bottle, leaving the remainder of her limbs to operate the pump with varying success. I was expecting to hear the sound of bagpipes at any moment. The tent was erected in 3 mins flat, ensuring – as always – that the tent flaps opened to a prime view of the lake. I scuttled into the woods and collected armfuls of deadwood (each one an entomological study) and lit a large fire. Finally we had respite from the bugs – with the exception of a few persistent mosquitoes that had evolved with fireproof jackets. For dinner we had gravadlax with fresh dill sauce, followed by pan fried duck breast, parsnip puree, roast shallots and fresh mange tout. Well, that’s what the packet said – though it looked like lentil stew to me and tasted significantly worse. 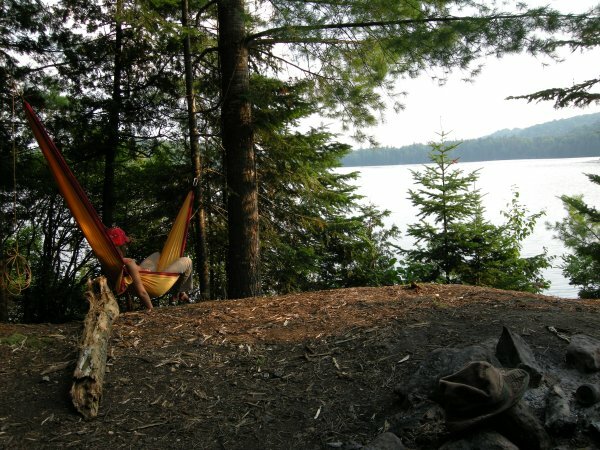 After dinner, we retired to the hammock to share a glass of port (yes really) and as we watched the sun gently slide down behind the tree tops casting long shadows over the tranquil lake, we considered if it was possible to be any more smug. We concluded, unanimously, that it was not. Time for a bit of domesticity before turning in for the night, which involved the usual anti-bear tactic of tying up all foodstuffs, sun cream and toothpaste high up a tree, creeping into the tent in darkness and zipping everything shut before turning on the torch and swatting all opportunistic mosquitoes. The Loon is an aquatic bird native to North America (and some parts of Europe where it is unimaginatively called “diver”), and takes its name from one of their calls that resembles the yodel of drunken lout. Their second call is very different – a haunting and melancholic two-tone cry that echoes across the lake and makes the hairs on the back on your neck stand to attention – the kind of sound that one, thankfully, never forgets. They are quiet remarkable feeders: they gently cruise the water surface and in an instant disappear to the bottom of the lake for minutes at a time, only to reappear in a completely different part of the lake with a beak full of fish. Being very solitary, when you hear two calling to each other across a lake it’s really quite a treat. Unless you’re trying to get to sleep. 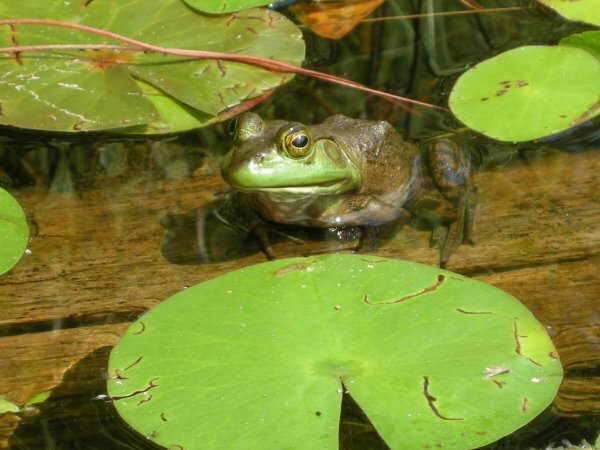 But the loons weren’t the biggest source of noise that night – the prize for the most repetitive and annoying sound in nature goes to the bull frog. All night long there were two chatting away to each other. The conversation seemed like, “hello bob, how you doing”, “am doing good tom, how are you” – all bloody night long, without a break. I considered adding some choice language of my own, but was worried that I might give them something to talk about. To add to the cacophony, a small family of mosquitoes had taken refuge between the tent’s flysheet and inner sheet and were busy murdering Handel’s Messiah. That’s the problem with real nature – it makes a hell of a racket. The following morning we took a swim in our lake and surveyed the bug bites on our legs and arms over our oatmeal and fresh coffee breakfast. Time for another taxing day in the lakes. With increased bravado, we plotted a course that encompassed plenty of portages through a series of small lakes to the east of Lac des Sept Frères. We packed the clothes explosion back into our rucksacks, tucked our waste into a tiny bag and left paradise just as we’d found it. I’d love a recording of people’s first reaction to this site – there’d be some very rich language. Whilst paddling down Lovers Lake, we had the fortune of a closer encounter with a couple of Loons, who were having a chat across opposite sides of the lake. Against a backdrop of total silence, they called to one another in their inimitable haunting hoots. We sat motionless in the canoe utterly transfixed by this astonishing performance, each call echoing around the lake with the kind of piercing clarity that fills your ears and your heart to bursting point. I’d love to know what they were talking about – maybe it was about us. For the return portage we cheated – we just picked up the canoe at either end and simply carried it, which proved an adequate arrangement for the 185m back to Lac des Sept Frères. Once back on the main lake we quickly found the small gap in the trees (with the mandatory “caution, canoe on head” sign) indicating the next portage. Confident with our alternative hands-on canoe carrying technique, we set off into another bug infested wood, again leaving all our bags behind for the next relay. 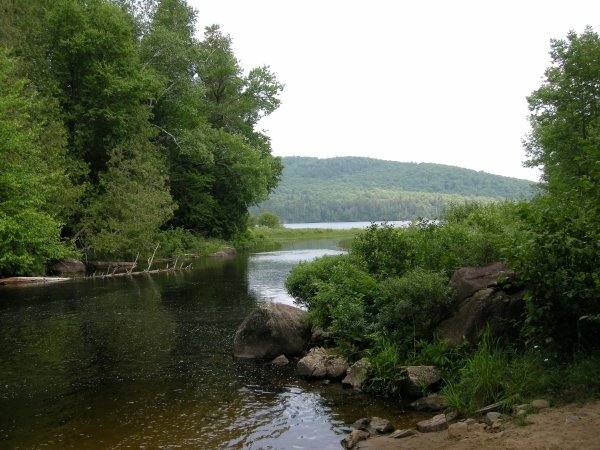 This portage had the added inconvenience of a steep and hill, some rotten wooden planks over a stream and several large boulders covered in slime. When carrying something as awkward and heavy as a canoe, it takes all the strength you can muster, until your body reaches breaking point and the canoe drops instantaneously to the ground. That day we managed four portages, 815m in total, visiting Lac Diamond, Lac Labelle and Lac Mercier on the way. We seemed to be getting deeper and deeper into inhospitable territory, with the lakes becoming smaller and swampier. Alison was at the front of the canoe and was always the first to set foot upon new lands, each time greeted with a small welcoming party of frogs, to her obvious delight. Lac Diamond was renamed Frog Lake in their honour. There was a pattern developing here: the more frogs there were, the fewer the bugs. This gave me an idea that harnessed the appetite of frogs, and so I invented the Frog Hat, in which one attaches a large frog on your head, to sit there happily munching on all the insects before they land on your face. Pure symbiosis – man and frog in perfect harmony. Patent Pending. The destination for the next evening was Lac des Grandes Baies, bordering another state park whose size alone promised a less swampy and bug infested habitat. Only a small channel separated “Inexplicable Spruce Lake” from our destination, so we were confident of an early end to our arduous day. Confident, that is, until we discovered that a platoon of beavers had beaten us to it and had erected their own version of Hoover dam. After a brief conference, we decided to run the dam head on. We retreated back up the channel, brought the canoe about and paddled like mad towards the dam. Faster and faster and faster as we sped towards the target, ripping though water, white foam churning from our paddles, the dam looming towards us – the point of the canoe struck the dam square on with a “thunk”, making a 2 cm indentation in a small stick and rendering the canoe motionless in an instant. The hight differential was probably only about a foot between both sides, but as we wrestled the canoe perilously over, it seemed more like Niagra falls. With the canoe unbreached and our bags dry, we hopped back in and slid away through the rushes – one more obstacle of nature satisfyingly negotiated – and headed into the jaws of the next big lake. It soon became apparent why beavers had built the damn where they did, for within 3 minutes of paddling we noticed an all too familiar sound becoming louder and louder. We watched in horror as the speed boat careered towards us, music blaring and forging a canoe sized tsunami in its wake. He saw us staring at him, but didn’t bother to acknowledge us grubby primates with contempt filled eyes. Oh well, back to reality. 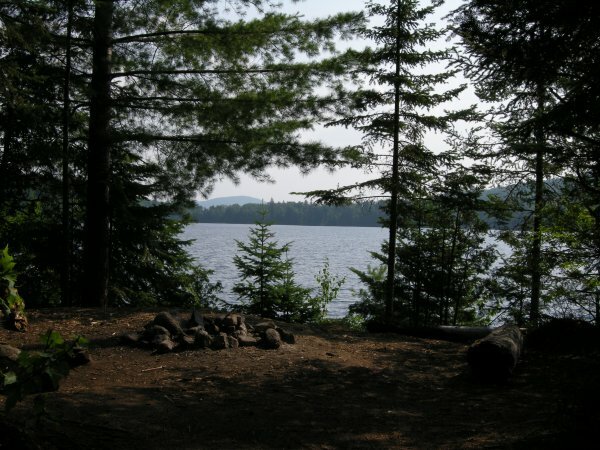 The campsite was quickly found as the boats vacated the lake and peace returned once more. This lake was much bigger with a few large cabins and wooden houses incongruously poking out of the trees towards the horizon. Settling into the campsite, it was easy to pretend the kind of solitude from the previous night, so up went the tent, hammock and fire and our bizarre normality resumed. That evening’s menu was exactly the same as the previous, just with a different name. Which was just as well because despite our best efforts with the water purifier something wasn’t quite right inside me – stirrings of colonic mutiny caused me to spontaneously disappear into the woods on a number of occasions, leaving Alison quietly chattering away to herself. Sleep was not a problem that night, thanks mainly to exhaustion and the cunning fabrication of ear plugs from some gauze in our first aid kit, having made a pact to avoid all sharp objects for the next 24 hours. The weather up to this point had been quite perfect – the bluest of skies and hottest sunshine, but this all changed the following morning as a grey misty blanket enveloped the entire lake. This was good news for two reasons: the idiot in the powerboat would probably take longer over his champagne breakfast, but more significantly for us, it would provide respite from the heat as we attempted our longest single portage – 920m back to Frog Lake that would then lead us back to Lac des Sept Frères and eventually back to the car. The idea of separate portages for the canoe and bags was dismissed and I was determined to prove alpha-male credentials by portaging properly and carry both rucksack and canoe together for the whole distance. Perhaps the trickiest part of portaging is getting the damn thing on your head in the first place, which involved the two of us doing an erratic Laurel and Hardy dance. Once there, a conveniently positioned yoke sits across your shoulders to take the weight and you grab an arms-length wooden strut that enables stability and some sort of steering. Amazingly, the canoe is perfectly balanced and, for a while, feels like regular walking with a large and cumbersome fibreglass hat. An illusion that dissipates after approximately10 steps as the yoke digs the full weight of the canoe into your shoulder blades. Nevertheless, we trudged into the woods in high spirits – even the steep and treacherously slippery hill was manageable. The biggest problem is that holding your arms out in front of you like this makes your chest tighten and renders deep breathing quite difficult, not ideal at the best of times but especially problematic when you’re gasping for air. 40 minutes later, three canoe drops, more bug bites than was possible to count, we reached Frog Lake to rapturous croaks from our amphibian friends. Nearly there. We took the last 220m portage in our stride, literally, and as we arrived at the main lake we met another group of pristine nooists surveying the entrance with trepidation. We must have looked as though we’d come from a different planet (a very dirty one), and the expression on their faces dropped even further. We bade them a cheery “bonjour” as if passing neighbours on a street, but these were the first people we’d encountered in nearly 3 days – with the exception of the idiot in the boat – and it felt rather odd. We passed the rest of the day paddling very, very slowly down Lac des Sept Frères, devoid of the faintest of breezes that afforded a mirror like surface to double the spectacular view. Herons gracefully and silently swooned over the tree tops, landing in inelegant heaps on improbably small branches that buckled under the huge weight, loons hooted and disappeared without a trace, dragonflies perched on the canoe enjoying the free ride – another hectic day in the life of a lake. We swam a few laps around a small island before demolishing the remainder of our rations, packing up for the last time and headed back to the put-in to rejoin the world. We journeyed back to Montreal in our little crap car and headed straight to the washing machine. It was doubly sad time, not only leaving the lakes but within a few days I’d also be leaving Montreal for London. We both vowed to return to do more nooing, perhaps in even more remote areas (of which there are plenty) and hopefully for a longer stay. That’s the end of the story folks – I hope I’ve given you a tiniest taste of my trips and impart some of the wonderful experiences I’m lucky enough to have had. For the nooing trip in particular, it would be easy to glaze over details with a bunch of superlatives, but the details themselves should set apart reality against hype. Most Canadians who read this would probably just shrug and say, “yep, that’s Canada”, but they’d probably be reluctant to shout about it too much. Can’t say I blame them. You are currently browsing the innerhippy blog archives for September, 2007.